Happy belated Christmas! I hope everyone enjoyed the DCRU and PGP blog hops I've been a part of the last couple of weeks. 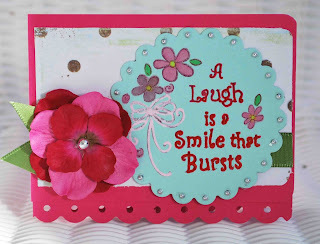 This week at Die Cuts R Us we are having special Guest Designers to share inspiration with all of you! 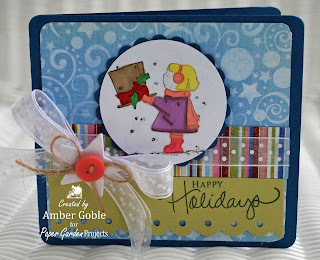 Our first Guest Designer is my sweet and crafty friend Jenn Koss! Check out her amazing treat box! 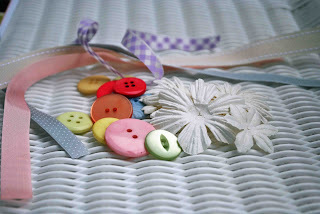 And don't forget, each day a new Guest Designer will share a special creation! Now a winner! I used random.org to find the winner of my mini kit for the DCRU hop! And it is Laura of Crafty Little Woman (aka Madeleine Bouquet). Just e-mail me Laura and I'll get your package in the mail. And if you are a fan of Twilight, check out Laura's blog post for today! I'm in love with my new Martha Stewart butterfly punch I used for this card! I've had my eye on it a while, just hated to pay so much for a punch. So word of advice, go to Michaels.com and print a coupon before you visit their store. Then you can get your punch cheaper! I used Papertrey Ink patterned paper to punch 2 butterflies and then layered them. And I have some happy animal news. We have a new animal rescue in the area, the Appalachian SPCA! Click on their name to follow the link! And I would be greatful if you would become a follower if you have Facebook. They are trying to reach 1000 followers by 2010! Their Facebook link is on their homepage! Guess what, it's white outside AGAIN! 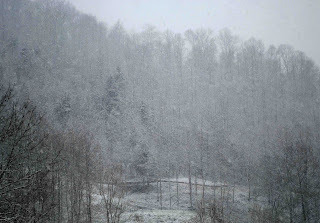 More snow and more expected for the New Year! I've already got Spring Fever! 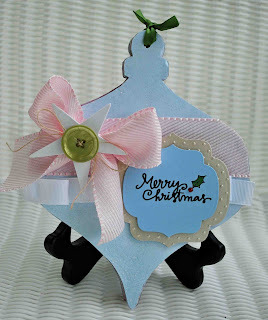 Merry Christmas and welcome to the Die Cuts R Us Blog Hop! 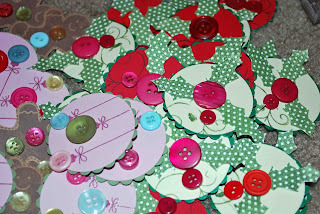 If you just happened by, please visit the Die Cuts R Us DT Blog to start the hop. And if you are already playing along, you should have arrived from the lovely and talented Cara's Blog. We know many of you are stressed to the max with holiday plans. Hopefully a little blog hop is just what the doctor ordered! So sit back with a warm cup of cocoa and enjoy the inspiration and a chance to win a gift! For the hop, each DT member picked their favorite product in the Die Cuts R Us Store and used that as the inspiration behind their project. This was an easy one for me! My favorite and most used product out there is my Cuttlebug. I use it on most every project I create, whether it's embossing or die cutting. It is such an affordable way to add spice to any project. And the embossing folders are super cheap! For my project I made a fun gift perfect for neighbors, teachers, etc. I love embellishing bottles, so cute. 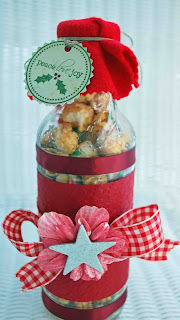 So I took this Sobie bottle (love their shape) and made a sweet Christmas treat. I added pieces of ribbon to hide the bottle name. Then I embossed a piece of cardstock using my Cuttlebug and the Houndstooth folder. I added a big gingham bow. Then I used white Prima Flowers and sprayed them with Peppermint Glimmer Mist from Tattered Angels. I added a chipboard star to top my flowers off. For my bottle top, I wanted to hide the cap. So I cut a felt circle using pinking shears then just covered the cap. I added a cute tag. Now fill the bottle with any candy, hot chocolate mix, whatever you can dream of. 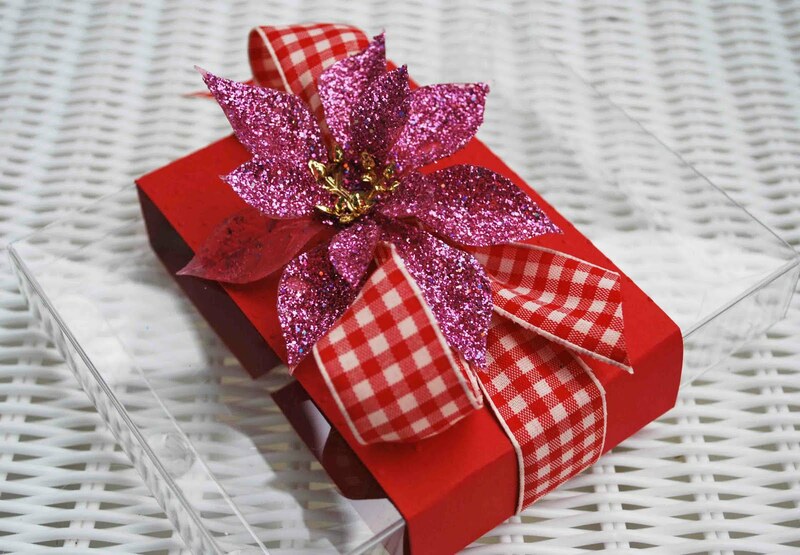 Your recepient will get a sweet present and a pretty momento of the holidays. I wanted to add a card to my project. Now for my secret word. Got your pen ready? CHIMNEY! And for a second chance at a prize, I'm giving away a little mini kit in honor of the DCRU Blog Hop. Just become a follower of mine and leave a comment and I'll randomly pick a winner at the end of the hop! And don't forget the Epic Giveaway going on now at DCRU DT Blog - please stop by for your chance to win! Your next stop is the sweet and crafty Claudia! Have fun!!! Hi everyone! 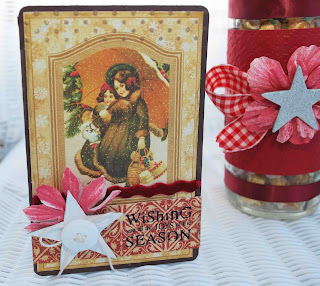 Welcome to the Paper Garden Projects Winter Wonderland Blog Hop! So grab a cup of hot cocoa and come walk in our snowy garden! You should have arrived here from Tracy's Blog. 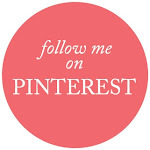 If you just happened to stop by, visit Paper Garden Projects blog to start the hop! 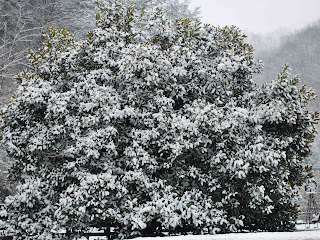 While you visit, subscribe to each Gardener's blog and take note of each designer's name and their Secret Snow Word in their blog post. Once you finish your garden tour, send an E-mail to custserv@papergardenprojects.com with the list of designers and their Secret Snow Word. Everyone who sends the correct list of designers and words will be entered in a random drawing to win a special frosty prize. You need to send an e-mail to the address above; please don't leave your list as a comment. You have until midnight (EST) on Dec. 21 to sent your snow-y list. 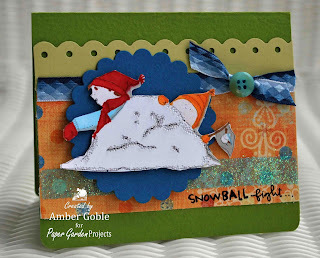 Check out the Frosted Winter Paper Kit I used to create these cards, available at PGP! 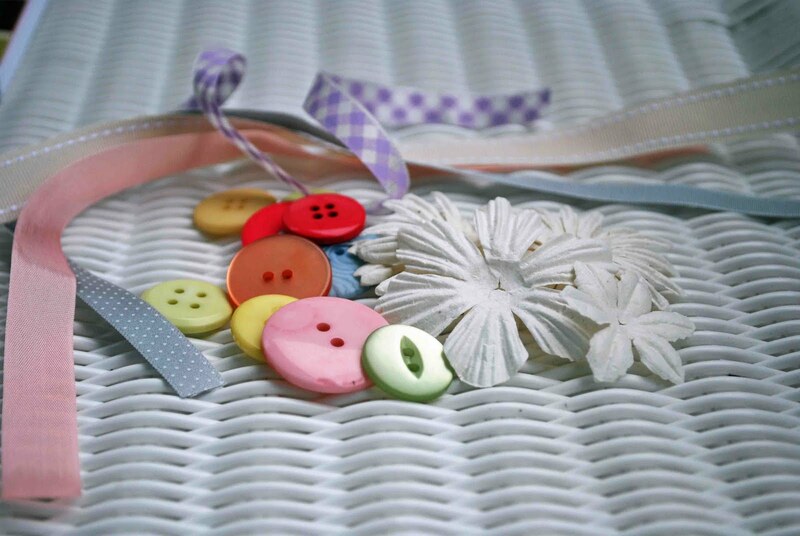 The patterned papers, cardstock, and ribbon coordinate perfectly and make crafting simple! 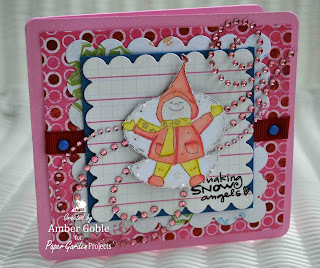 And look at the adorable Winter Wonderland Friends Stamps that I used. I hope you've enjoyed a little walk in a wonderful Winter Wonderland. Now for my secret snow word - BRIGHT! The next stop along the hop is Lorelie. 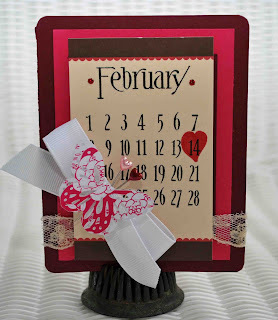 It's Tuesday and that means a new challenge at the Die Cuts R Us DT Blog! 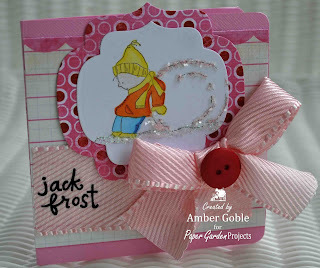 This week's challenge is to make a project with the theme "Naughty or Nice". You can interpret this any way you like and make any kind of project you want. I used my Cuttlebug and Swiss Dots Embossing Folder, Spellbinder Nestabilities - all of these products are available at the DCRU store. I also used a Colorbok Mini Album, Martha Stewart Ribbon, My Mind's Eye Paper, PTI Ribbon, Making Memories Chipboard, and a Melissa Frances Rub-On. Be sure to play along. And don't forget about the Epic Giveaway at DCRU! I needed a little "Christmas Break"! So I decided to make a couple of Springy cards! Visit the DCRU DT Blog to take a look at my Spotlight & check out the DCRU Epic Giveaway and what you can do to win!!! 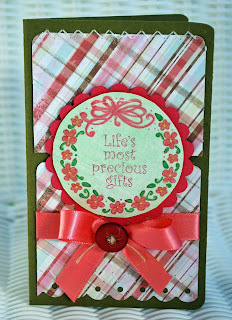 Today is challenge day at Die Cuts R Us DT Blog! This week is a fun one! 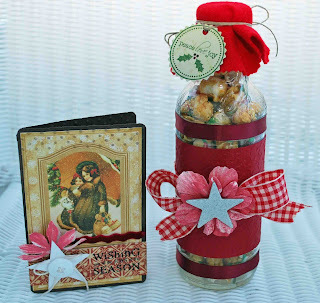 Create a project with a holiday feel! Now I know if you haven't already done this, that you will be soon....so just post it on your blog and add the link at DCRU to join the festivities! This week I decided on a different type of project. Is it a gift, nope. Is it a card, no again. 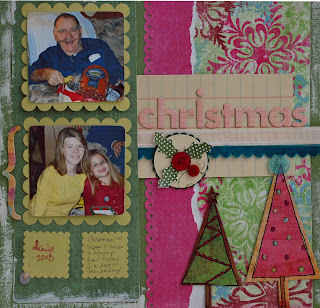 I decided on a layout of last Christmas: a gift to myself, lol! Kinda selfish, but I enjoy memories! This LO is near and dear to my heart just because of the great picture of my Papaw! We got him a fruit basket with a ham. He LOVES to eat better than anyone I know, so he just loved his present. The second picture is of me (I was going thru a brown hair phase at the time) and my cousin's little girl. The frames for my photos and stamps are Spellbinder Nestabilities. The Die Cuts R Us Store has a ton of "Nesties" that are perfect backgrounds for pictures. They make creating LO's easy! I also used Fancy Pants Paper and Chipboard, Cosmo Cricket Ribbon, Stickles, Tim Holtz Distress paint, buttons, Fiskars Scalloped punch, Marvy Punch, and PTI Stamps. The weather man was forcasting snow, but I had to see it to believe it! We got 3 inchs of snow today and it was picture perfect. And who's finished their Christmas cards? Not me!! Take a look at the mess! It's time for a new challenge at Die Cuts R Us! This week's challenge is all about gift giving! Create a project that can be given as a gift. It can be a LO, card, or altered item. Be sure to leave your link on Mr. Linky at the DCRU DT Blog. I had so much fun with my project. I was inspired by a recent creation of Michelle Wooderson's. I wanted to make a craft kit, with all the goodies that you need to make a creation. So I made a card kit. 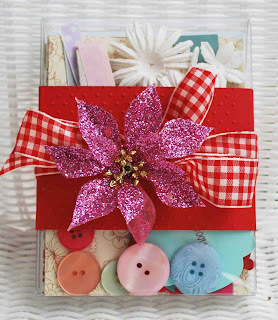 I started with a clear card box from Paper Garden Projects. I wrapped a portion of my box with red PTI paper. I used my Cuttlebug and Swiss Dots folder to emboss the center of my paper, that would be on the front of my box. 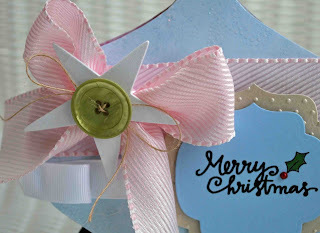 I then added a pretty bow and a pink flower Christmas decoration. Then I added cards made by My Mind's Eye. 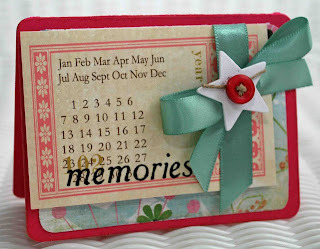 I used my Cuttlebug and Spellbinder Nestabilities to cut out die cuts and then stamped them with sentiments by PTI. So the recipient will only have to add the premade sentiments to their card. I also added buttons, flowers, and ribbon to my little kit. 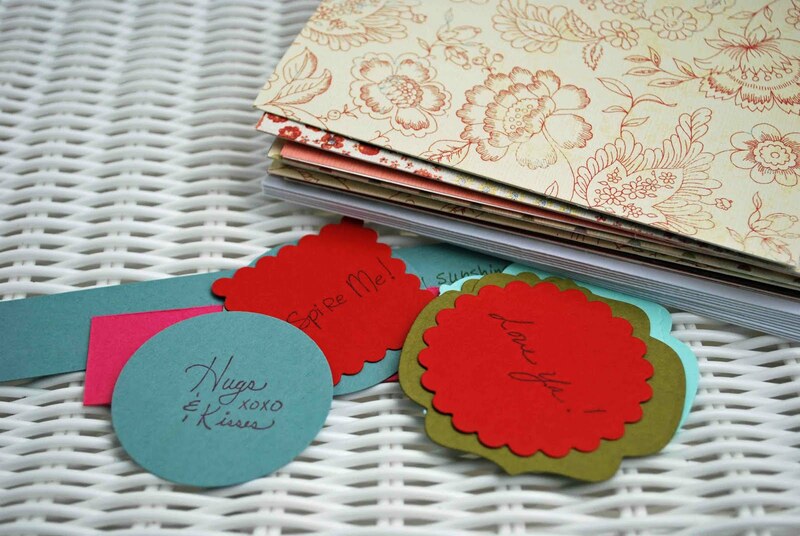 Everything a crafty cardmaker would need to make a quick creation. 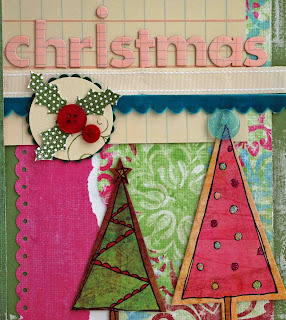 Visit Die Cuts R Us Store, where the Cuttlebug, embossing folders, and Spellbinder Nestabilties are available. And visit the DCRU DT Blog to see the DT's beautiful creations. And be sure to play along!